Travel for Christmas? You bet! Big cities are exciting at Christmas! 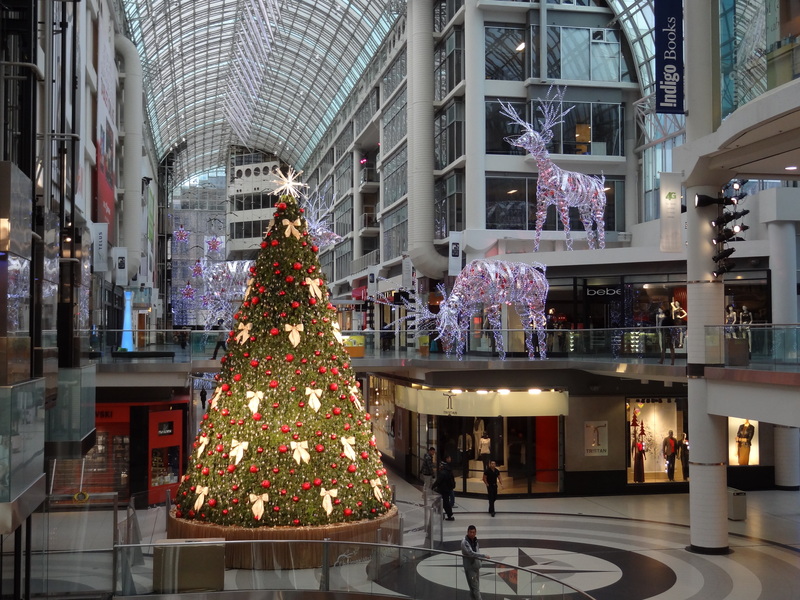 The Eaton Centre in downtown Toronto is always dressed for the season and when you can walk through after hours, the Swarovski tree gleams just for you. It’s that time of year when everyone we know starts turning their attention to home & hearth. Not these discerning travelers—our excitement is just starting to build as we anticipate the travel season ahead. And that travel season begins with Christmas away. This morning’s Globe and Mail greeted us with a travel section headlined “Six Destinations to Get Your Christmas On!” and they weren’t talking about department stores. So, I guess we’re not alone, but people often ask us how we do it. When everyone is running around from family obligation to grocery store to the kitchen and back, we might find ourselves in a hot tub at a hotel, basking on a pristine tropical beach or experiencing white-glove service at a wonderful restaurant with a view of the Mediterranean. All of these are things we’ve done on Christmas Eve over the past years. It’s been a long time since we spent Christmas at home, and we’re not going to start this year! It all started back when our now 23-year-old son was eleven. He was a student at the National Ballet School of Canada, a two-hour trip by plane from where we lived. It had never occurred to us that when the students performed with the National Ballet of Canada in the annual Nutcracker that it would run over Christmas, and that the students could not go home. So we adapted. 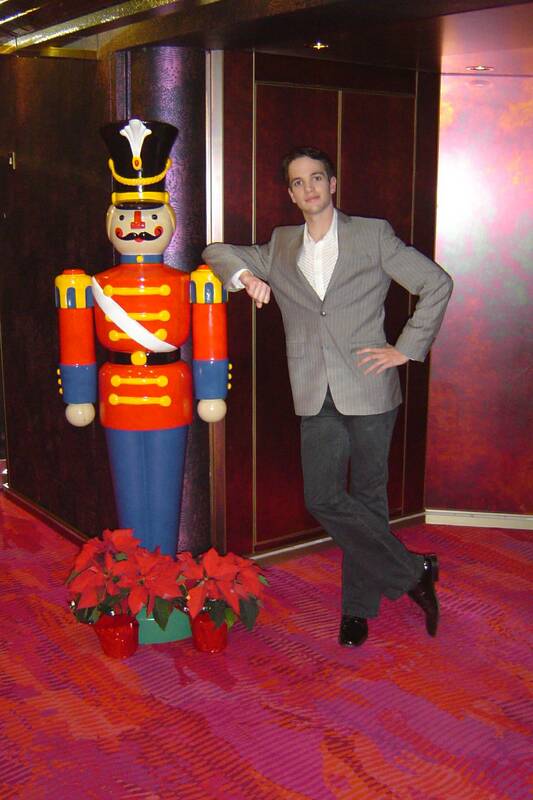 Ian and a Nutcracker aboard our Holland America Christmas cruise. That first holiday season away, spending Christmas in a hotel with a child, taught us many things about ourselves and the season. It taught us that breaking with tradition can be liberating (Christmas Eve celebrations with the family were fine, but year after year after year of the same thing can begin to wear on one). It taught us that we could be more creative with the Christmas morning ritual under the Christmas tree opening presents (the hotel staff even helped us as we sent Ian on a scavenger hunt all over the hotel to find his Christmas present that first year). It taught us that having Christmas dinner in a hotel is not without its upside (impeccable service, incredible food and no clean-up: what’s not to like?). And over the years, it has taught us that experiences are far more important than presents. After several Christmases in downtown Toronto at a hotel, Ian finally had a year when he didn’t have to perform. Rather than spending it at home, we took a Christmas cruise (which we’ve talked about before). The most important lesson from that trip (apart from how utterly amazing it is to spend Christmas eve on a private island in the Caribbean under a palm tree), that the presents are secondary and are only as important as the sentiment behind them. That Christmas we had a family agreement: one present for each other person, bought after the ship sailed from Fort Lauderdale – and they had to be wrapped. Streamlining those Christmas presents gave us time to really think about each present and each person. It was wonderful. 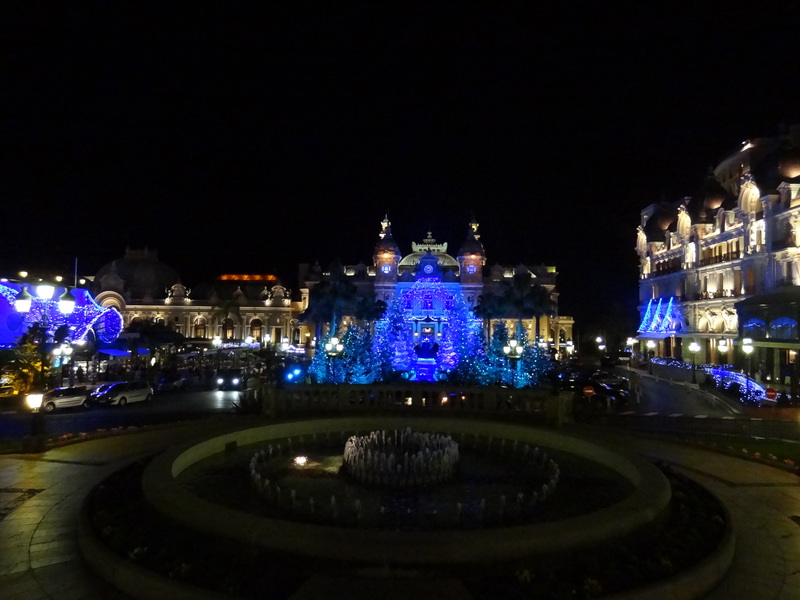 Casino Square in Monte Carlo makes a magical scene dressed for Christmas. 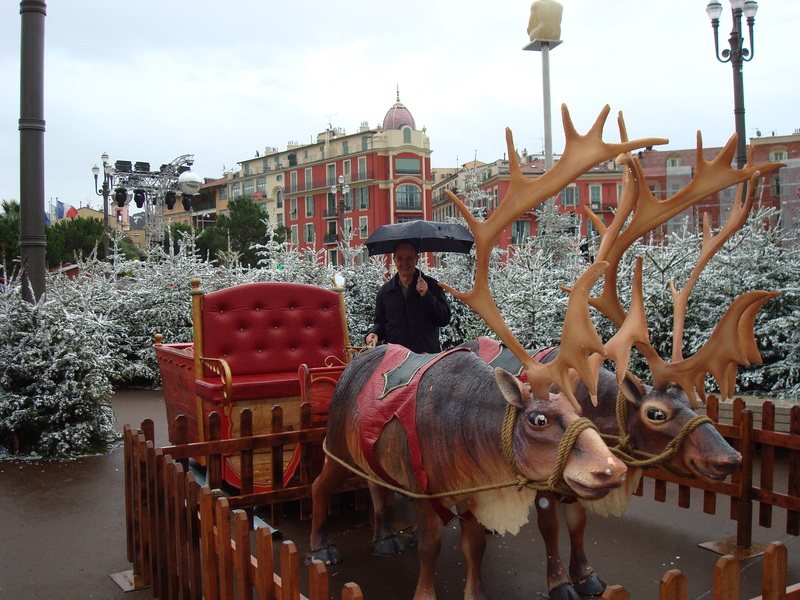 Then there were three recent Christmases in Monte Carlo and the French Riviera. There were so many wonderful memories that we made together as a little family. Without the stress of the extended family activities, we have been able to focus on enjoying what the season has to offer – and on the Riviera, there was much to enjoy. The Christmas market in Nice, the incredible decorations in Casino Square in Monte Carlo, the streets lined with trees highlighted with fake snow, the outdoor champagne bar at Christmas Land on the waterfront in Monaco, the chance to see Les Ballets de Monte Carlo performing on their home stage with Princess Caroline in the royal box, Revéillons (Christmas Eve dinner) at the Fairmont in Monte Carlo. And now we will prepare for our upcoming Christmas in London. We’ll take in the English National Ballet’s Nutcracker, several fabulous dinners; we’ll visit the Christmas windows on Oxford Street and visit the Christmas markets. And the memories will be our presents. 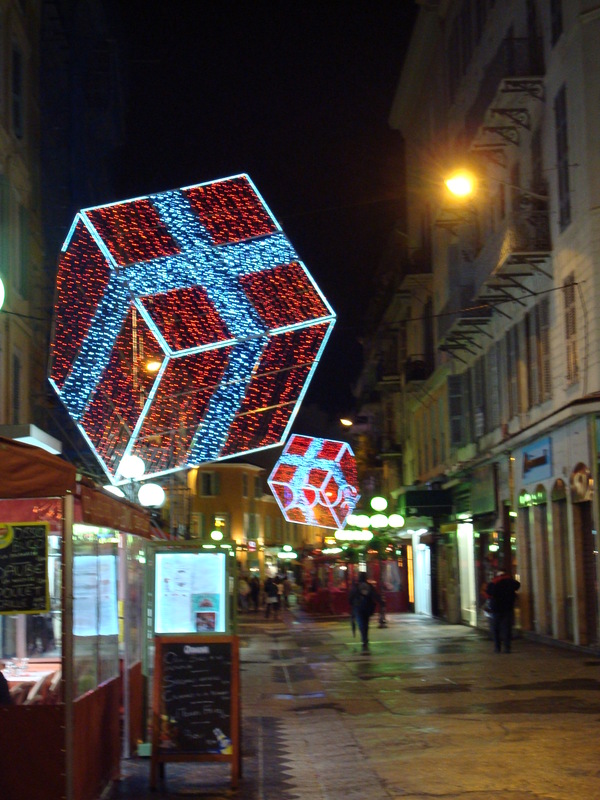 Art takes in the Christmas ambience in Nice, France. So, how do you get away from the expectations that your extended family has of you over the holidays (for those of you who have often thought about doing just that)? Start getting them warmed up to the idea many months before. By the time Christmas comes, they’ll think it’s always been that way. Okay, there will be a few who will balk – but that’s only because they won’t have you to share their misery. Get your little travel group to set some family ground rules. Activities? Budget? Take our advice, agree to one present each. Set up all the important parts in advance. If Christmas dinner is important, get on it several months before. You’d be amazed how many people eat out on Christmas Eve and Christmas Day, not to mention how many restaurants are not open. Hotels are your best bet. Do something completely different from what you’ve done before on Christmas Eve or Christmas Day. One Christmas we went to a movie at a theater in a mall late in the afternoon on Christmas Eve. There were exactly four other people in the theater and when the movie was over, we emerged into a completely quiet mall that had only hours before been pandemonium. It was like taking a deep cleansing breath. Don’t think that you have to go far away. Get in the car, drive for a couple of hours, and you’re away for Christmas. Remember to Skype your family at home – and don’t gloat! Ringing in the New Year: Monte Carlo Style!